I still can’t believe that we can’t buy vegan cupcakes at Whole Foods here in Nashville. They keep saying they’re going to outsource, but why not make them in-house? The cupcakes I make from Vegan Cupcakes Take Over the World are better than any cupcake I’ve ever had, so their constant excuses fall on deaf ears with me. Vegan cupcakes rule and there is definitely a market for them here! Enter Fiddle Cakes on 8th Ave South. I called the other day to find out about their vegan offerings, then realizing they would be closing in just a bit, I hopped in the car and drove straight there. I walked up to the counter and asked for one of everything that was vegan. I purchashed an almond shortbread cookie, a pumpkin chocolate chip cookie and a banana split cupcake. Turns out the woman who helped me is also vegan so I gave her my card and we chatted a bit. Next, I tried the pumpkin chocolate chip cookie. It was pretty good, but a little salty and I would have liked a little more pumpkin spice flavor. The banana split cupcake didn’t have the best consistency compared to some of the vegan cupcakes I’ve had, but the flavors were great. The cake tasted like real banana and had little chunks of pineapple and chocolate chips and it had walnuts and a maraschino cherry on top. The icing was very sugary, but was also quite fresh and yummy. Way better than the stuff you’d get on most bakery cupcakes. Even with my little criticisms, I enjoyed everything and ate all three items in one sitting, ended up with a ridiculous sugar high, then crashed hard. I don’t recommend trying that. I know better, but it was so hard to resist! 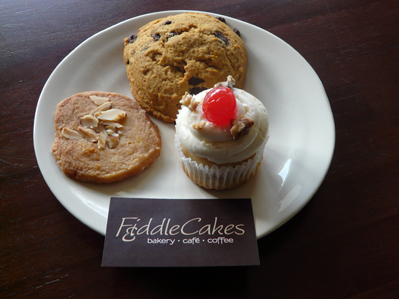 Fiddle Cakes also serves lunch (soups, salads and sandwiches) and they can make their vegetarian menu items vegan. Their sandwich bread is vegan and comes from a bakery in Clarksville and they have Follow Your Heart Vegan Gourmet cheese. All their recipes are their own and they use sweeteners like organic evaporated cane juice, molasses and agave nectar, plus they have gluten-free items as well. They also do catering and special orders. Yay! Nashvillians, let’s support Fiddle Cakes and show this city and its restaurants, bakeries, etc. that we can keep vegan-friendly businesses alive and thriving. And you better believe I’ll be back to FiddleCakes now that they have vegan cupcakes. Holler! I just ENVY you this delicious feast of the cup cake. The cookie and the banana split also look pretty yummy. And yes i’ll surely back Fiddle Cakes if they have such a freat offering like the one in the picture. Hey guys! We have vegan chocolate cupcakes with peppermint “butter”cream icing and toasted coconut cupcakes today. I can’t wait to go there! Looks so yummy! The coconut and the chocolate peppermint cupcakes are SO GOOD!!! Had a really nice vegan soup and sandwich the other day too. Thank you, Fiddle Cakes! For most up-to-date news you have to visit the web and on internet I found this website as a most excellent website for most up-to-date updates. I found it on 21 spot, you should focus on quality backlinks building, it will help you to increase traffic. Awesome post. You should use social websites to increase traffic and make your site go viral. I loved as much as you’ll redceive crried out right here. Thhe sketch is attractive, you authored subject mtter stylish. in a hour – as well as less. by indian tribes and provide payday advances in the internet. at a glance. By loading up clash of clans gemas infinitas your site? will certainly suit advanced players. many people feel more at ease if they may be in a position to see a healthy bank balance, but that reassurance comes having a price. We are a bunch of volunteers and startting a new scheme in our community. amazing. It sort of feells that yoou are doing any distinctive trick. find out how to add posts to your WordPress website.